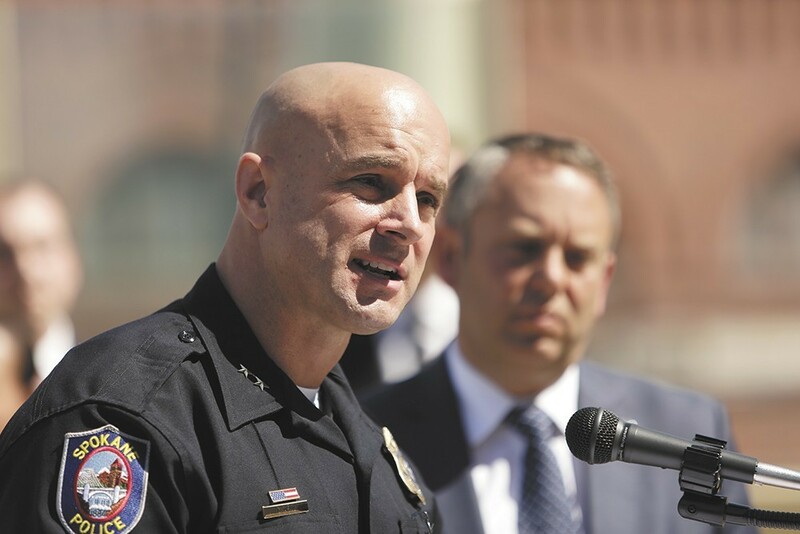 Spokane police officers shot more citizens in 2017 than they have in decades. Now the department is planning to roll out a new use-of-force policy this fall, and the City Council has approved an online, interactive tracking and reporting system. During a recent Ombudsman Commission meeting, Chief Craig Meidl explains the proposed revisions to the department's policy. He says most of the department is already using the proposed principles and tactics, but there are "pockets" of officers who could benefit from those being codified in an official policy. "I think we agree, this is actually going to keep our officers safer," Meidl told the commission. "It's going to tell them, not only are we encouraging you, we're telling you." Some of the tactics Meidl highlights specifically include using time, distance, cover and de-escalation, when circumstances permit. The revisions, if approved by a committee of officers, will also emphasize the "sanctity of human life," he said. The revisions come after SPD updated its use-of-force policy through the Department of Justice's collaborative reform program. It was after a discussion with police Ombudsman Bart Logue that the two agreed another update was necessary. Meidl says Logue and his staff reviewed about 100 policies from agencies around the country. Additionally, the City Council approved the $35,000 purchase of an online use-of-force dashboard, which will track officers' force and identify patterns and trends. Mayor David Condon declined to sign the budget ordinance, but it still becomes law. In a letter to council members, he cites, among other reasons, the fact that the city's IT department already has the ability to create online dashboards using city data. Condon also points to a $12,000 annual fee and support staff costs not mentioned in the council's approved budget ordinance. "While well-intentioned, transferring reserve funding to purchase software may not be the best use of public funds in this instance," Condon writes. The original print version of this article was headlined "Time, Distance, Cover"